It’s vacation time and you feel like improving your game in a fun atmosphere? The Chess’n Math Association’s day camps are the perfect place to indulge yourself in your favorite activity with other young people who share your passion. More than 3,000 young chess enthusiasts from 5 to 14 years old participate annually in our chess day camps. We offer a program of chess activities, diverse sports and cultural activities suited to all chess levels and interests. Surrounded by qualified instructors as well as experienced, bilingual and responsible monitors, children can enjoy their activities safely. Summer Chess Camp : Several weeks are available. Christmas Holiday Chess Camp : One or two camps are available depending on the calendar. Daycare available (See our registration forms for details). Intense chess program: chess, chess and more chess! Chess program: group lessons, practices, friendly tournaments, matches, Simuls, etc. 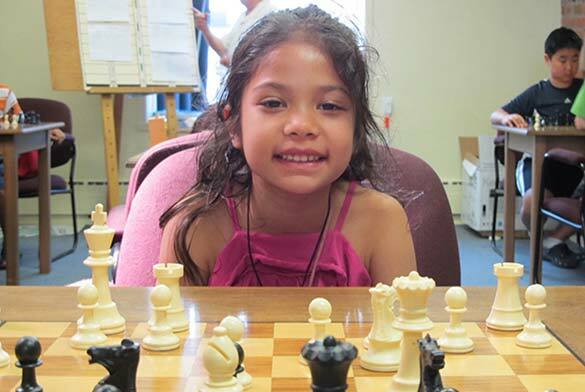 Did you know that the Chess’n Math Association has been organizing day camps for 30 years? Don’t forget, all players are welcome, including beginners! ** Tell your parents they can receive an income tax credit for your chess camps.